Tejas is India's indigenous Light Combat Aircraft(LCA) developed by Hindustan Aeronautics Limited (HAL). It is the world's smallest, light weight, multi-role combat aircraft. The LCA is designed to meet the requirements of Indian Air Force as its frontline multi-mission single-seat tactical aircraft to replace the MiG-21 series of aircraft. Short takeoff and landing, excellent flight performance, safety, reliability and maintainability, are salient features of LCA design. The LCA integrates modern design concepts like static instability, digital fly-by-wire flight control system, integrated avionics, glass cockpit, primary composite structure, multi-mode radar, microprocessor based utility and brake management systems. 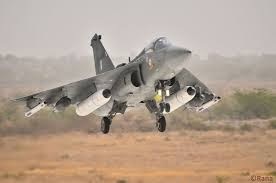 A naval variant of tejas is also being developed.